Stay Safe & Look Great Too! Whether you work in a hazardous environment where your feet are at risk from falling items, or whether you spend a lot of time in a workplace with wet and slippery floors, having a high quality pair of safety trainers is essential to your health and well-being while at work. Failing to wear the correct type of shoes in a potentially dangerous workplace can lead to a range of accidents from trips, falls or impacts which can not only lead to lost work hours but can also lead to ongoing medical problems. Preventing this type of situation from occurring is not only important for employers but also for the workers themselves. While women who work in an indoor office environment where they spend most of the day sitting at a desk may be able to wear heels or sandals during their working day, women who work in many other types of workplace need to choose something more suitable to protect their feet. Kitchens, laboratories, warehouses, outdoor environments and construction sites are just some of the potentially hazardous workplaces where women need to consider investing in some high quality safety trainers to ensure that they minimise their chances of experiencing an accident or injury while at work. Which Are The Best Safety Trainers For Women? If you are looking for the best safety trainers for women you may be finding it challenging to make a final decision. Here are five of the top pairs on the market today so that you can make an informed purchasing choice. When you want a pair of trainers to wear to work that offers ultimate protection for your feet but which also look great, the Ottawa safety steel toecap work trainers are the ideal choice. Made from high quality materials and featuring a practical lace up fastening, this smart footwear will effectively protect the toes from impacts without compromising on comfort. Designed to be stylish yet safe, the Ottawa trainers have suede leather uppers for excellent durability even in the workplace and a functional lace-up front which offers optimal support to the front of the foot as well as extra security of fit. The safety steel toe cap protects the toes and front of the foot from injury from any falling item or impact that may occur during the working day, yet with such an attractive and casual look, these trainers can easily be worn outside the work environment for casual use. As an added bonus, the gum rubber soles of these shoes are resistant to oil to offer additional protection when walking on slippery floors, and the EVA insoles are shock absorbent to provide extra comfort and support while walking. Lee Cooper is a workwear brand that is synonymous with quality, so it isn’t surprising that a pair of their safety trainers features in our top five list of high performing footwear. 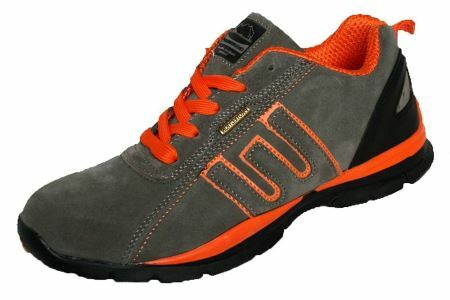 These stylish trainers look just like regular casual trainers, however they are suited to the rigorous environment of the workplace with a steel toe to protect the feet effectively as well as electrical hazard rating. The great design of these shoes also ensures optimal comfort for the wearer with padding where it is most needed to ensure that they can be worn all day long without experiencing any pain. These safety trainers are made in a practical black colour to match most work dress codes but have a classic casual look that matches both workwear and casual weekend outfits for maximum flexibility. The practical lace up front ensures great support for the front of the foot and optimal stability, while the padded collar and ankle has been designed to ensure that the wearer can benefit from all day comfort to reduce pain and rubbing. The steel toe cap protects the front of the foot from any kind of accidental impact or injury up to 200 joules of impact, so the wearer can rest assured of their safety. This footwear is also slip-resistant, so they can be worn in all kinds of working environments both indoors and outdoors without being in danger of slips and falls. These stylish safety trainers by popular brand Groundwork are incredibly attractive while ensuring optimal protection for the feet while at work. 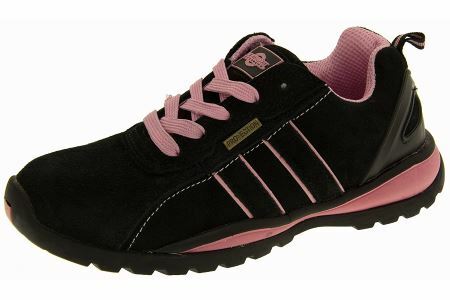 Available in a choice of appealing colours, the black pair will work well with uniform dress codes in many workplaces. The leather uppers are durable and long lasting while the steel toe cap protects the foot from injury. When you want to look good while staying safe, this is the footwear for you. The leather uppers of these trainers are extremely durable and waterproof, protecting the feet effectively from inclement weather and wet working environments. As they are also surprisingly lightweight, the wearer will not suffer from excessive fatigue even when they are worn for a full working day. The steel toe cap meets minimum safety standards, protecting the toes and the front of the foot from any kind of impact caused by a drop or fall for excellent safety in a hazardous workplace. With a lace up design, these trainers offer support to the front of the foot which boosts stability on uneven surfaces while the padded collar and tongue add extra comfort of wear, ensuring that the foot stays supported all day long. As an added bonus, these shoes can even be machine washed for easy maintenance and cleaning. When you need a pair of safety trainers which look and feel high quality, this pair from Dickies fits the bill perfectly. Their microfibre construction is incredibly lightweight, meaning that they can be worn for a full working day without causing discomfort or excessive tiredness in the legs, and with the steel toe cap, you can rest assured of your safety. Comfortable, attractive and protective – this footwear is the whole package at one affordable price. 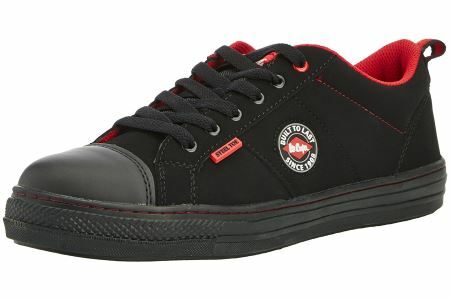 The Ohio safety trainers from Dickies have been designed with the needs of the hazardous workplace in mind. Constructed from high quality materials to ensure a long lifespan and excellent durability, this footwear does not compromise on lightweight comfort. The wearer’s feet will not be weighed down thanks to the microfibre material, even with the protective steel toe cap which meets the recommended workplace safety standards. These toe caps can resist up to 200 joules of impact for optimal prevent of injury from falls, impacts or drops. The lightweight rubber outer soles are also slip resistant and offer excellent traction on all kinds of surfaces, even those which are slippery or wet indoors or outdoors. The tongue and collar have been well padded to ensure support for the foot as well as excellent comfort for all day wear and the soles are also resistant to heat, making them perfect for wear in a range of industrial and professional environments. The EVA inserts also offer additional support and comfort for the foot while the overall look is casual and practical enough to wear outside of the workplace for better value for money. Made by the reliable and reputable Groundwork brand, these high quality safety work shoes look great, feel great and provide excellent protection for the feet in potentially hazardous working environments. Lightweight to wear all day, these comfortable trainers are durable and flexible while offering optimal support for the foot and guarding against slips, falls and impacts. These ultra lightweight work trainers from Groundwork are guaranteed to not cause the wearer excessive fatigue, even when they are worn for an entire working day on your feet thanks to the synthetic outer material. Even though they are incredibly light to wear, these trainers feature a strong steel toe cap which protects the front of the foot and the toes from impacts and drops up to 200 joules of impact. The full comfort footbed offers support and protection for the sole of the foot when walking or standing on hard or uneven surfaces, and ensures that all day wear is a breeze. With their lace up front, these work shoes ensure additional support to the front of the foot while the outer soles have been made from rugged and tough rubber which is guaranteed to be resistant to slips even on wet or slippery surfaces. These shoes meet with current safety standards for complete peace of mind for the purchaser and can even withstand a compression of up to 15000 Newtons. Most importantly, these lightweight work trainers look fantastic and are stylish enough to wear anywhere, not just in the workplace. Since they are also waterproof, they can be worn when working indoors or outdoors in all weathers. Available in a wide choice of designs and colours, the purchaser can either choose one of the colourful designs or the plain black version which works well in environments where a strict black dress code is enforced, and thanks to their casual yet functional look they work well as a casual footwear option at weekends. These are five of the top performing pairs of safety trainers that can be purchased on the market today. All of them have been designed to be practical, functional and yet incredibly safe to ensure the wearer is given optimal protection from the hazards that they are likely to encounter during their working day. Guarding against slips and falls due to non-slip soles and helping to prevent injury from impacts to the toes through the inclusion of steel toe caps, all of these safety trainers are a comfortable solution to safety in the workplace. Invest in any one of these pairs of safety shoes and you will not only look good during your working day but you will also enjoy excellent comfort all day long and have the peace of mind of knowing that you are taking the best possible precautions to ensure your own safety. Why Wear Safety Shoes At Work In The UK? While many men wear safety shoes to work as a matter of course, lots of women have never considered investing in a pair. However, they are just as important for women as for men in any kind of hazardous environment. Whether you are working with dangerous items, chemicals or heavy machinery, or walking on wet or slippery surfaces as a standard part of your job description, you should make sure that your chosen footwear can protect you from any kind of injury that could occur in the line of duty. If you need to stand up as part of your job for a long part of the day, you may find that your posture suffers without the right kind of shoes to give you the essential support that you require. Choosing the right safety shoes can ensure that your body is held properly in the optimal position to avoid causing ongoing aches and pains that could, in the end, result in a long term injury due to back, knee or ankle pain. Many workplaces are keen for workers to invest in safety shoes because they want to protect themselves from potential law suits which could arise. Companies have a responsibility to help protect their workers from any kind of harm, and therefore one of the ways that they can do this is to recommend that safety gear like correct footwear is worn at all times. While different types of safety shoes are suited to different types of work, they all incorporate features which will help to keep you safe in your own specific professional environment. So, if you’re ready to invest in a pair of women’s safety trainers, what are the key features to look out for? If you work in an environment where there is a risk of injury to the toes, either from falling objects or from impacts, it is imperative to choose safety footwear that has either a steel toe cap or a composite toe. While at one time the only shoes that offered this type of safety protection was heavy duty boots, these days it is possible to find attractive and practical women’s trainers that offer the same kind of optimal guard for the toes. If you are working in an outdoor environment where you will regularly be walking on muddy, wet or slippery surfaces, having excellent traction on the soles of your shoes is essential. However, many employees who have indoor working environments still require the same sort of non-slip sole. 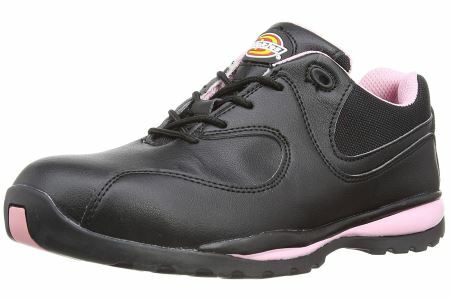 Hospitals, veterinary surgeries, laboratories, warehouses and kitchens are just some of the workplaces that could have wet and slippery surfaces underfoot, and any woman who works in one of these places should consider buying a pair of safety shoes that have non-slip soles and impressive traction on all kinds of flooring. If you are working in certain construction, workshop or laboratory environments, ensuring that your footwear has adequate protection to resist damage from chemicals, alkalis and acids is vital to preventing your feet from being injured. Safety trainers which have chemical resistant soles are the best choice if you are at risk from this type of injury at work. Women who work with electrics or in any kind of environment where they may be at risk of being exposed to live currents should choose safety shoes which have been electrical hazard rated to ensure that they are well protected. While it is still possible to buy a good quality pair of strong and sturdy safety boots which will offer optimal all-round protection against a range of hazards in the workplace, this type of footwear is often extremely heavy and uncomfortable to wear, and if you work in a role that requires you to be on your feet for much of the day, they often prove to be an unsuitable option. Luckily, safety trainers are the ideal solution. Lightweight and comfortable, they offer all of the protection of a boot but with a more comfortable and relaxed fit, feel and style. Even better, they look great and can double as regular shoes for going out on a casual basis.